Grilling food safely only takes a few extra precautions and steps. Grilled foods are delicious year-round, but the summer months are when grills are used the most. You can prevent property damage, injuries, and fires by following these general safety tips and the manufacturer’s instructions. • Only use charcoal and propane grills outdoors and place your grill at least 10-feet away from any structure. This includes decks, railings, overhangs, and trees. • Buy a fire extinguisher, learn how to use it, and keep one near your grill. • Spray bottles filled with water work great for smaller flare-ups. • Keep your grill grates clean and oiled before each use. • If you have a smoker-grill, be sure you tuck away your cord to avoid anyone (yourself included) from tripping over it. • Pets and children can easily burn themselves on a hot grill or tip it over. Keep them away from the grill area. • You should never leave your grill unattended while it’s fired up, so be sure to bring out any supplies or designate a runner. 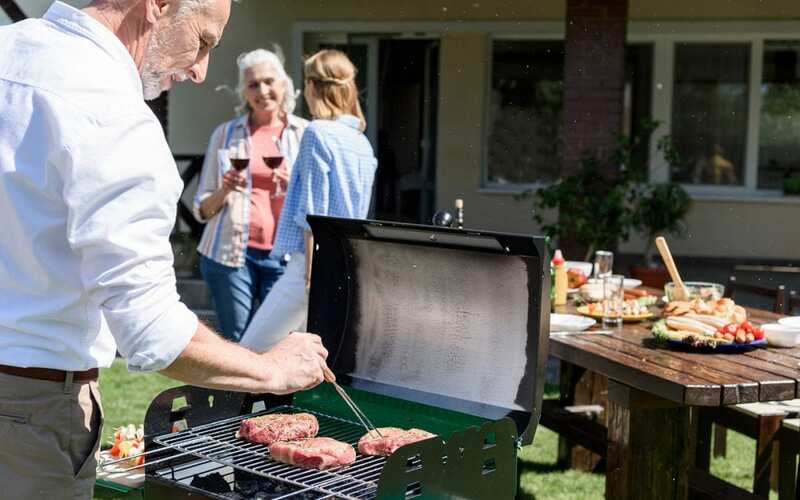 For summer parties, you could also keep a meat-dedicated cooler near your grill if you’re cooking in batches so you have all you need while you cook. • With propane grills, you don’t need to continuously hit the igniter. Turn off the propane, wait a few minutes, then try again. The National Fire Prevention Association reports that there are 7,000 gas grill fires every year. Grilling food safely also means checking your grill from top to bottom as well as the propane tank and hoses for leaks. You should do this every time you turn on your grill, but it’s especially important if you haven’t used your grill in a while. Never turn on the propane or hit the igniter with the lid closed. This is a dangerous mistake made by novice and beginner grillers. Gas rushes into the grill quickly, and you’re at risk for large, uncontrollable fires, burns to yourselves and others, or worse, your grill can explode. • For propane grills, check for leaks. ABC NEWS recommends a solution of half water and half dish soap. Put it on the hose, and if it bubbles you have a leak and should not use your grill. • If you use charcoal, check for any signs of rust. Hot coals can fall through weak spots and start a fire. Time and temperature don’t go hand in hand when grilling. Always use a meat thermometer. The USDA and FDA both have proper temperature guidelines for various meats and seafood. These temperatures will kill food born bacteria. If you’re smoking your meats, keep temperatures inside the smoker between 225°F to 300°F. This is a safe temperature range to cook any meat or fish. After you’ve cooked your food to the desired temperature, place it on a clean tray to avoid contamination. Also be sure to discard any marinade or sauce that’s touched raw meat and now contains germs and bacteria. Following these grilling safety tips will promote a safe experience all season long! Hub City Home Inspections provides home inspection services to South Mississippi, including safety audits. Contact us to book our services.